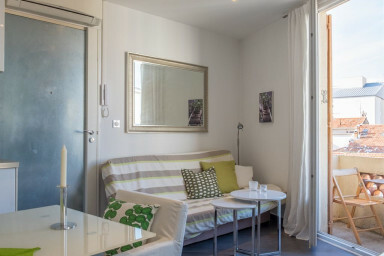 Tastefully decorated studio, situated in a classic French house. This studio apartment is completely renovated, animal and smoke free, 31 m2 on the 3rd floor in a traditional french house, located where Rue Louis Blanc ends and turns into Rue Borniol. Ideal location for both conferences and holidays. Walking distance to everything. The apartment has of course air conditioning and is ideal for two adults or a family with a child. In the bedroom you have an open floor plan. Either a comfortable 160 cm double bed, or if you want two 80 cm beds, a large shower and washbasin with a big towel dryer and toilet in the corner of the space. You can pull the curtain between the beds and the shower area. In the seating area you have a sofa and Cable TV with a large number of channels, and DVD players. Fiber internet gives you a fast connection (up to 100 Mbps), so you can work efficiently from here. The apartment is located in the neighborhoods north of Marché Forville where you walk in a few minutes. If you pass by the market you will in about 10 minutes reach the old harbor and beaches. A walk to the Festival Palace will take around 10 minutes.